Queen's Blade Battle: Unlimited Alleyne on the scene! As Nowa helpfully advanced a couple weeks ago, here's the redesign of the expert elf! Can't really point out many changes (the old clothes were a bit more puffy, like flowers, I guess? ), but then again, if it ain't broken, don't fix it, am I right? Yay! One of my faves! 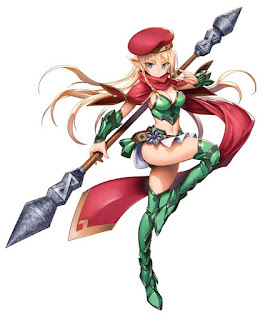 Also, her hat went from tomato to red beret. Well I'm glad she hasn't been changed drasticly like Claudette. She seems rather "Cammy-ish" to me now. Could be the beret.Now I gotta wonder how Cattalya is gonna look.